This is a genuine, original, vintage. rare, historical M.W.T. 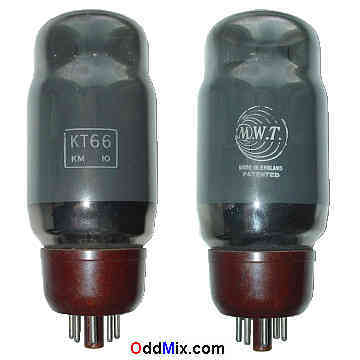 [Marconi Wireless Tube] KT66 beam power electron tube. The KT66 was developed for Class A and A-B audio high power amplifier use in England in the late 1930's. The tube is excellent for high power Hi-Fi audio amplifiers, antique radio restoration projects or to set up a private vacuum tube museum. For reference only - no longer available!